Can North Korean Missiles Reach the US Mainland? To cite: S. Chandrashekar, Rajaram Nagappa and N.Ramani. Can North Korean Missiles Reach the US Mainland? ISSSP Report No. 05-2017. 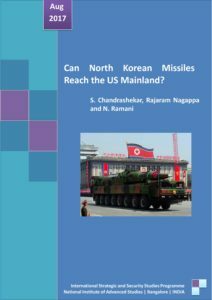 Bangalore: International Strategic and Security Studies Programme, National Institute of Advanced Studies, August 2017, available at http://isssp.in/wp-content/uploads/2017/08/Can-North-Korea-Missiles-Reach-the-US.pdf. Using publicly available information on the launch of North Korea’s Hwasong 14 ICBM we demonstrate that North Korea’s ability to threaten the US mainland with a nuclear weapon is critically dependent on the mass of the warhead. In order to reach all or most of the US, North Korea needs to build a nuclear warhead with a mass of 150 to 250 Kg. Though North Korea has conducted five nuclear weapon tests, including a possible boosted fission test in 2016, it may still not be able to field a nuclear warhead of this mass. One can therefore expect that it will continue to conduct both nuclear weapon and long range missile tests as it strives to signal to the world that it is indeed capable of reaching the US mainland with a nuclear weapon.